Established in 1996 by Con Lynch and Pat Dennehy, Compound Feed Engineering (CFE) was founded to become the preferred supplier of pelleting consumables to the compound feed industry. The business is now the leader in this market and has a reputation of supplying innovative and leading industry products and services to clients in Ireland, UK and Europe. To be recognised by the market as the leading pelleting solutions provider that creates measurable value for, and exceeds the expectations of its customers. To be the preferred supplier of pelleting consumables. To provide leadership through quality business results. To achieve operational efficiencies for our customers. CFE have a diverse range of clients from large multi-national blue chip companies to integrated co-operatives and small regional and family owned SME’s across multiple industries and sectors. In recent years there has been substantial growth in pelleting outside the compound feed area, in particular Wood Pelleting, and Recyclable Materials industries. CFE now embraces all the other applications that use pelletising equipment and have quickly moved into specialising in the supply of new dies and the refurbishment of roll assemblies and dies. CFE’s prime objective is to supply a total service and engineering solutions package to the pelleting industry. 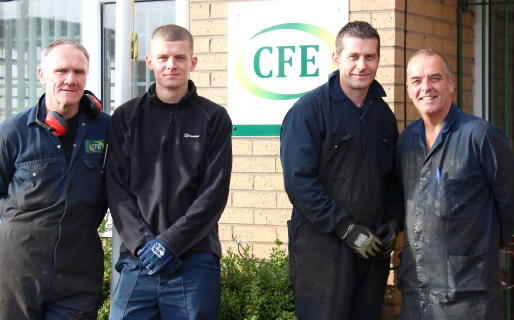 Planning for the industry’s future needs, CFE initiated a major investment plan at the UK plant in Haydock, Merseyside. Roll refurbishment has been semi-automated with handling manipulators and overhead cranage installed. This investment has placed CFE in the position to capitalise on the bigger pelleting consumables that are part of the modern and efficient pelleting industry. The administration function remains in the Ireland head office in Castleisland where daily contact with customers and suppliers is maintained through CFE’s Freephone number. CFE can offer a tailor made pelleting solution called a pelleting consumables contract which can be designed to meet the requirements of each specific customer. This concept is also known as a cost per tonne contract which basically means you only pay for what you produce. CFE fully believes that benchmarking input costs in milling engineering is the direction that industry needs to go. CFE will provide the total solution including maintenance of equipment. The service package will provide solutions to the challenges facing milling engineers. The company offers the complete solution and has made the investment in technology and people to ensure that this is achieved.